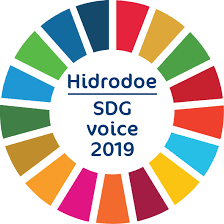 Marie-Christine Marghem, Federal Minister for Energy, Environment and Sustainable Development in Belgium, named Hidrodoe as one of the 6 SDG Voices 2019 for the promotion of the Sustainable Development Goals (SDGs) of the United Nations. In September 2015, these Sustainable Development Goals were formally adopted by the UN General Assembly with Agenda 2030 for Sustainable Development. Over the next 15 years, 17 SDGs, linked to 169 targets, should form an action plan to put the planet back on course towards sustainability. Every year, the Federal Institute for Sustainable Development (FIDO) chooses a number of ambassadors or 'SDG Voices' that make the general public enthusiastic about the SDGs. Together with 5 other organizations, which were recognized as 'SDG Voice 2019', Hidrodoe takes the role of ambassador of the 'Sustainable Development Goals' to heart. Hidrodoe will promote the 17 different SDGs for a whole year and will raise awareness among its wide audience. As SDG Voice, Hidrodoe puts the SDGs in the spotlight with a lot of interaction and fun. A trip around the world of the SDGs, an obstacle course to get pure water, a science show about plastic soup and many other SDG initiatives are on the calendar of Hidrodoe this year. This way, Hidrodoe informs about the 17 SDGs to all his visitors, both to schools and to families. To give them inspiration and engage them to take initiatives themselves to improve life all around the globe. Hidrodoe is with its large variety of visitors an ideal place to get that message across.